Our God who is gracious and merciful! ~ Is the death of the faithful one! I will weep when you are weeping; When you laugh I’ll laugh with you. Psalm 34 John Foley, SJ alt. Because of this anguish my servant shall see the light; because of this knowledge my servant shall be content; My servant, the just one, shall justify the many, and shall bear their iniquity.Therefore I will give a portion among the many, and the spoils be will divided with the mighty, Because my servant surrendered self to death, was counted among the transgressors, bore the sins of many, and interceded for the transgressors. R. Ours were the sufferings he bore *ours were the sorrows he carried. V. Unless the grain of wheat falls into the ground and dies, it remains but a single grain of wheat; *ours were the sorrows he carried. V. Glory to the One and the Word, and the Breath of Love. to overcome our selfishness and such cruel inequalities among us. The violence we preach is not the violence of the sword, the violence of hatred. It is the violence of love, of kinship, the violence that wills to beat weapons into sickles for work. Elisha healed the commander from Syria. For the growing disparity in wealth in our world, ~Have mercy on us. For the persistence of racism in our community, ~Have mercy on us. For the times we blame the poor for their plight, though it is caused by institutions and structures of privilege and injustice, ~Have mercy on us. For failing to own our own selfishness, failing to denounce the sin that puts convenience, luxury and ease before the love of our suffering sisters and brothers, ~Have mercy on us. For lowering the tax burden of the rich and for corporations while we dismantle and defund programs that benefit the poor, ~Have mercy on us. God of compassion, hear our cry of repentance for the ways in which our religion has added to the suffering in our world through participation in its causes, or through neglect caused by fear, complacency, despair, or the seduction of comfort, status, and power. May our prayer of repentance be a point of conversion, turning the hearts of many back to you. 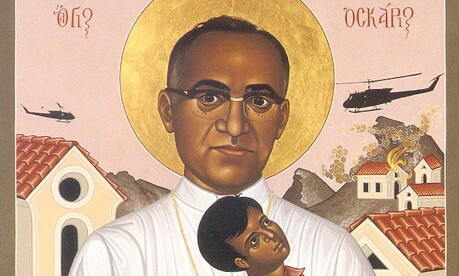 Fill us with the boldness of your servant Oscar Romero; enable us to denounce sin in our world as we announce your reign among us, and to lend our hands and our hearts to building that reign in our world, for you live and reign in the power of love now and forever. ~Amen. May the God of Life, the God of the poor+ incite us to the violence of love, the violence of kinship, the violence that beats swords into sickles for work. ~Amen.